Hi all, My name is Hindy Pearson. I'm originally from Montreal, lived in Toronto for 13 years, Florida for 5 and England on and off for 10 years. My greatest passion is animals, and my dream is to have a house on enough land to have rescued horses, donkeys, chickens, dogs, cats and rabbits. 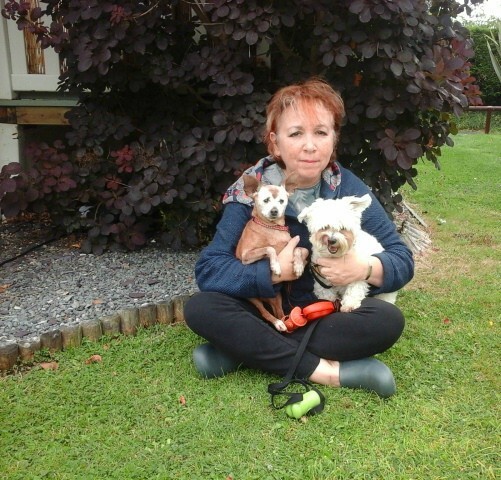 I am a Pet Care Consultant, offering one on one behaviour and training advice to people who share their lives with dogs and cats. I also run The Saffy Pearson Resource Centre, which is a mobile version of my consultancy business, but this service is free. I am so excited to start making money through an online business since I prefer to be my own boss, and that's the way I'm going to accomplish my dream. Looking forward to connecting with you. 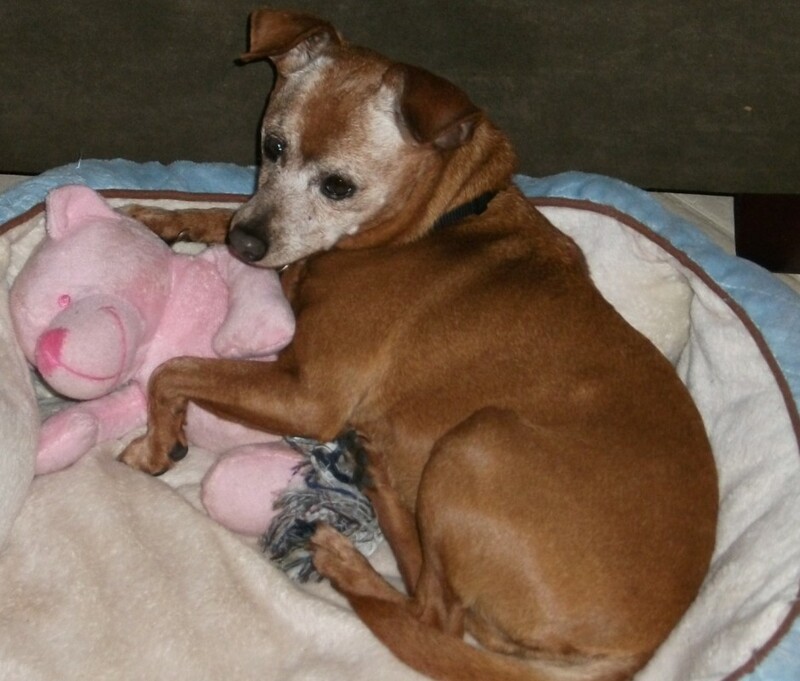 And of course, that cute little dog that is hugging its pink teddy - too cute for words! Wishing you all of the very best with your online business! Hi Hindy i am looking into an online store selling physical products. I read your post and was wondering if you got an answer which related to your original question and which helped you set up your store (or not)?? I never bothered with the store. Too much trouble. Great site! I left you a comment on your site (it was hard for me). I too am an animal lover and have a pet related site. I would appreciate the return favor. I wish you the best of success. After almost 18 months I'm leaving WA as I've had no conversions or referrals. I can't afford to stay and keep paying to play. Good Luck to you and thanks for being a friend! Hi, thanks for the connection. I can now follow your posts. Hope you're enjoying your time here. Good luck in all you do with WA! Hey Hindy, thanks for following me back! It's an honor. Hi Hindy! Thank you for the follow! Welcome to a fellow animal lover, Hindy! I also wish I could have a house and enough acreage to rescue as many animals as I can. Right now, 5's the limit. Thanks for the follow, and I'll look forward to your posts. I left you a comment on socializing your puppy. Hello Hindy. I like how your caringforaseniordog website is coming along. I found you while searching for questions about online stores. I joined WA to learn to build a website for my daughter. She wants to have an online store. She's an art major and she's already selling some of her stuff. She's doing custom artwork. Unfortunately I only get to work in WA 1 or 2 hours a week, so it is very slow progress for me. I tagged the question you posted "how do I set up an online store". You received a lot of nice advice that I'll go read myself. You have my dream!! Acres waiting for the rescues. She also wants to have a mobile spay/neuter van (or at least pay for one that someone else runs) that drives around and "fixes" stray dogs and cats. There are so many euthanized dogs and cats in Oklahoma, because people don't want to spay and neuter. It's ridiculous! Sounds like a dream! I should come and live near you. Shelters are killing animals because it's their mentality. There is a no kill equation proven to end the need for killing healthy and adoptable animals, yet many shelter directors don't want to know. If a low cost spay neuter clinic opened, or the local shelters helped educate, it would make a difference. We volunteer with a GREAT organization called GHART (Going Home Animal Rescue and Transport). We take shelter animals and transport them in big vans to Denver, Minnesota and Chicago where there are shortages of animals. So, instead of euthanizing them in Oklahoma, we ship them off where they get adopted. It's so cool... unfortunately, we can't get NEARLY all the animals. We can only ship like 60-70 at a time, but every animal we can save is progress. You and your wife are incredible people. I wish I knew more kind and compassionate souls like you. Never say only, you do more than most people ever even think of doing. Awesome niche. I'm looking forward to reading your sites and blogs ! That is my favorite rescue horse in my profile picture ! Oliver ! Thanks for the follow and good luck to you! We must keep in contact. My wife and I are very passionate dog lovers. That's wonderful. Will you have a pet related niche? Anyway, just wanted to say that I decided to turn my blog post about blog tips into a training - what do you think? Hey Hindy, this message came after the previous one and thank you for the follow! All the Best for the Holidays! Great niche and worthy cause with Caring for Senior Dogs. Best wishes for you. Thank you Ben, very kind of you to say. Hi Hindy, thanks for following me. I wish you much success. Thanks for the follow! I look forward to learning from your experiences. Hello Hindy, nice to meet you and thanks for the follow, as well as for visiting my profile page. Its touching to hear about your plans to help animals in need. I am a dog owner and this sounds so nice to hear. I firmly believe that through WA's training you can pursue your goals and ideas, and enable you to be your own boss. I wish you much success here at WA . Thanks for the follow. Good luck with WA and success in everything that you do. Hi Hindy. Thanks for following me back. I am an animal fan too and my partner and I would love to get a dog, but I have had a hard time getting settled and we rent. Hey David, if I can offer any advice, please let me know. When you say rent, does that mean you aren't allowed pets? Yes. Maybe a cat, but not a dog. Pretty hard to find a landlord prepared to let you have a dog. I know, it really pisses me off. Many places even limit the number of cats, but they're easy enough to sneak in. Cool name. AngryRabbit....I like that name. Explain its meaning? "It makes me mad when people say I turned and ran like a scared rabbit. Maybe I was like an angry rabbit, running from one fight into another!" I read that quote somewhere and i like that sort of humour and it just popped into my head when thinking about a username. Hello HPearson, thank you for following. I am now following you. To our success. Thank you for following me all the best. Hiya Hindy, sure do appreciate the follow. Love those two puppies of yours, absolutely precious! Hi Hindy, thank you for following me. You surely wil make your dreams come true with the help of the WA community! Success. Thanks, there's no way I could do it without WA that's for sure. Thanks for following, hope you accomplish your dream soon. Looking forward to connecting with you too. Thanks for the follow. Just looked at your site an a little surprised that you thought it was boring. People care for their pets like family members. And I am one that always uses the same vet. Hi, I don't think the information on my site is boring, I think the design or lack of one makes it aesthetically boring. Where/when did I say that anyway - don't recall. You are in the right place. I'm into dog rescue. PM me any time. Thanks for the follow back Hindy. Hope is all going well in your journey here at WA. You're very welcome, I wish you the same. Thanks for the follow Hindy, best of luck to your success here with WA! Thank You for the follow! All the best to you!! Hi Dan, thanks for all that great advice but I've been here 2 1/2 months so I'm long familiar with all this, but I appreciate your efforts. Hi Hindy, Thanks for following me back! Hello Hindy. Interesting name. Am looking forward to WA and following WA friends such as yourself. I am looking forward to building a sustainable income in 2016. Thanks for the follow Hindy. Wish you much success with WA! I'm touched!! I don't think I usually inspire anyone to do anything other than maybe tear their hair out. I'll go have a look now. Thanks! Okay just read it. Crap! Do you mean to tell me I have no more excuses? Actually I went to Pilates this morning, and to strengthen my wrists the teacher suggested pushing up against a wall. Can you believe I'm too lazy to do that? Maybe while my water is boiling for my morning cuppa I should do it then. I'll give it a go. I did make it to Zumba also this week. I must be desperate. Left you a comment. Hi Hindy and thanks for the follow. I follow back and wish you all the best. Take care! I like your goals. You are already organised and successful so I think your online success is pretty much guaranteed. Thank you for the follow. Best of luck for the business. I hope you like my profile photo, that's cloudy the leopard. My pleasure, see you around!! Thanks for the follow. I'm a big animal lover too and have several rescue cats and dogs sharing my home. Thanks for looking after the critters. Hi Gary, I love hearing you rescue. Nothing makes me crazier then people who buy from backyard breeders. Good for you!! I feel the same way about backyard breeders. I live in South Carolina and there are no laws regulating puppy mills. About half of my rescues were dropped off on my road. The other half came from a retirement community where stray cats had several litters. I'm maxed out, but I love everyone. Dear Hindy, thanks for sharing and for accepting my invitation, most appreciated. Seems you're doing very well, so keep on track and let's stay in touch, Desmond. We are here to help! Hi Hindi, I love animals too! I used to have a Maltese & Pomeranian! Hi, I don't quite understand what you're asking exactly. I started taking riding lessons a long time ago in my 30s, but only did it for about a year don't know why. I had just started jumping... I do love horses as well. You're lucky. I don't know anyone that has horses. Wanted to volunteer with rescued horses, but no opportunities anywhere near where I live. Frustrating!! Thanks DarkFire, that's very kind of you. Saffy was a puppy mill dog my husband and I rescued. She was kept in a chicken coop for 8 years breeding. We only had her 9 months then she died, from what I believe to be veterinary neglect. There was just an article in the Mail today, Britain has a £100m a year puppy mill trade. Very admirable aspirations, I hope you have great success with your dreams. Thanks very much, I wish you the same. Hi Ches, I love horses as well. I took some lessons quite a number of years ago, and really enjoyed it. Don't remember why I stopped come to think of it. I'm glad I like the site. Senior dogs are a particular passion of mine. It's the only one I'm working on at the moment. I got overly enthusiastic when I joined, and started 2 sites in the same niche. It started to do my head in, and I realised it was a very bad idea to tackle more than one as such a newbie. I'm leaving the other one alone for now, and hopefully will go back to it once I'm more settled in with this one - which will be who knows when!! I wish the same to you. I agree, there's no end to what you can write about dogs. I still have so much I want to write about on this one. Eventually I suppose the rest will come. It would be nice to write about another niche, just to have a break. Hello Hindy! I'm still a newbie but am loving the training. You've got such a good background and a worthy goal. I'm certain you'll be very successful! Thanks Cheryl, I think we all need to hear those words. I wish you much success as well. Thanks Ange, so kind of you to say. I wish you success as well. Hi Hpearson, thank you for the follow. I hope to work with you here at the WA community. I wish you success in all your endeavors! I really admire your dream of helping rescued animals. You have a big heart and you will make your dreams come true if you just push forward. If you ever need help with anything just ask. Hi Lori, Are you still living in Montreal? Just thought I'd let you know, analytics is working on my second site. It probably was just a glitch. Thanks for your encouraging words, I wish the same for you. Yes I am still in Montreal. Not born and raised but a recent move here. I'm happy Google analytics is working for you now. It's been my experience that analytics doesn't always work right out of the box sometimes and all you can do is wait it out. Thanks Hindy to follow me back. Hi Hindy, Interesting profile. I wish you every success in achieving your goals. Thank you Hindy for the follow and many blessings to you here at WA. If you have the time or wish to, please check out my training (Bottom Right Blue Button) on my profile page. I explain ways to help you build a better website, ways to make some extra $$$ with your WA training, and best practices here at WA. I also post a humorous blog every Sunday. Enjoy! Hi, thank you for the follow and I wish you all the best. Have a lovely day, see you on here! Thanks Kel, I look forward to that day. Welcome to WA. I just added you to my G+ and left you a message on the site. Hi Lina, Thanks very much. Pleasure to meet you. Now I have to figure out how G+ works, don't know anything about it. Hi Keane, Thanks for that warm welcome. So nice of you. I love being here, and taking this journey with all of you. I may just take you up on your offer... I seem to have lots of questions!!! And stop by my page sometime, you are more than welcome to. Thanks, I won't. You either!! I'll tell you, being here is the best thing I couldn't have done. I don't really get this kind of support anywhere else. People mean well, but they don't get it. I love being surrounded by the enthusiasm, commitment and passion of everyone here, supporting each other as they reach their goals, and fullfill their dreams. Welcome to WA and congratulations on going premium! Hi Hindy, thank you for following and hope you are able to reach your dreams sooner rather than later. Be determined and you will get there. My name is Stephanie. I went premium three months ago and have since then built a couple websites, which you can check out on my profile page. I have moved up in the Ranks to 11, so I am now an Ambassador of Wealth Affiliate. I have over 1,400 folks following me. I work to offer as much help as you need when first starting out at Wealthy Affiliate. If you get stuck and have questions, let me know and I will help. You can also ask the community at large for some assistance. Happy you are here!! Welcome to a new chapter towards your personal and financial freedom. Thanks Stephanie, it's very nice to meet you and thank you for your offer to help. It's much appreciated. You are most certainly welcome. I hope you find everything you are looking for at WA. We'll be in touch! Congrats on becoming a Premium member! Best of luck to you in the future. Welcome and good luck! I'm new too and can't wait to get started. This opportunity sounds amazing! I can't believe how much I've learned in just a few days. Without this step by step help I couldn't do it. It's very important to follow each step, and do each task at the end of the video before you move on. Good luck! Welcome to WA. I wish you well. Hi Thanks very much. I'm definitely finding people friendly and helpful. Don't worry I haven't been shy about asking questions. I can't move forward if I'm not understanding something. Thanks very much. I feel very good about my decision, and I appreciate your kind offer of help. Thanks very much what a warm welcome. Success to you as well. Congratulations on going Premium! Well done! You've made the right decision, and I'll do my best to assist you as and when you need it. Thanks for the follow. How exciting to work with animals for a living. Just thought I would get in touch and see how things are going with you! I hope all is well and you are enjoying yourself here within the WA community. You're welcome, Hindy! I'm glad you're having a great time at WA and progressing :-) As for creating 2 websites, I myself have found it a struggle to focus on 2 sites at a time because there's just not enough hours in the day as I still work full-time in my job (soon to be part-time). It really depends on what free time you have available though. I would recommend on focusing on the 1 website until you have a good amount of traffic to it and generating sales. So while that website is making you some money, you can start a 2nd one. Just an idea. Yeah, step-by-step training is definitely the best way to learn because it's so easy to follow somebody else's footsteps, and you can watch the videos as many times as you like for the knowledge to sink in. Hi Hindy, lovely to connect with you and hope look forward to some more interaction in the future. Just met in the Live Chat. The answer to you question is 1/ the green Get Started Here button top left of your screen, and 2/ the black Affiliate Bootcamp button top left as well. I'm not sure which one you've started, but which ever one it is, you can start the other course, unless of course you upgrade to Premium in which case you may continue with the current course you are pursuing. Hi Top Achiever, I've just completed the Get Started Here course. I thought the Affiliate Bootcamp was only if you wanted to become WA affiliate. I wanted to carry on with what I've been learning so far. I have to upgrade for that. Thanks for your help, and the Quick Guide link. That is correct. How do you propose to continue? There's only one option if I want to succeed - upgrade. You have come to the right conclusion! I have read your profile and I believe that you have a great niche to promote and you certainly have a passion for it, if you can afford the yearly upgrade it's a LOT cheaper. I've gone this route as $47 per month is a lot in my estimation. In the long run, the yearly payment is the best and most economical way to sustain your training, and if you think about it, you are getting ALL the training necessary, all the web hosting and immediate community help as well as access to Kyle and Carson. Thanks, yes if there's one thing I'm passionate about it's animals and their welfare. I do think $47 a month is a lot, and that's potentially for years. I can't believe how much is offered on this one site. I've been trying to do this on and off for years, and finally thought I found help a few years ago. Turns out she had no idea what she was talking about. I was researching whether or not Chris Farrell was a scam, and found a blog written by someone promoting WA. After all this time I've finally found a place to get step by step help. I know a lot of it in theory from my research over the years, but never knew how to create a step by step plan, and put it into action. Finally I have. Excellent. So we can start with that. Let me know when you've written 10 Steps To Treating Agression In Animals - this will be PART of your content for your main landing page. Let me know when you've done that. Hi, thanks for that help but aggression was just an example, at least for now. 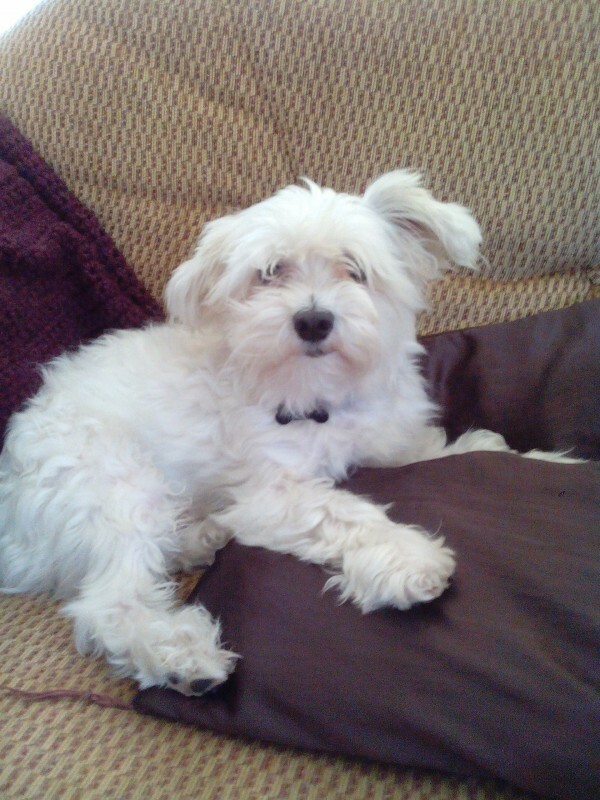 The two sites I've created are Crate Training Your Puppy and Caring For a Senior Dog. Will upgrade to premium today or tomorrow because I'm stuck without a step by step guide to follow. Thank you for adding me to your network Hindy. Hope you are enjoying it here at WA and I wish you all the best with your new online business! Hi, Hindy. Welcome to the 'Cyberhood.' I love Canada, esp. BC. Beautiful country. I want to go back and see some more. I have one article that you might enjoy. Hi, nice to meet you too. Don't go in the winter unless you love the cold, snowstorms and winter activities. i will try to remember that, Hindy. Thank you! You sound like a real animal lover Hindy, perhaps this could be a niche that you choose for your online business? There is a ton of opportunity online within absolutely any niche and I just wanted to let you know that you have a community of help behind you here at WA. Let me know if you ever need a hand with anything moving forward simply replying to this comment. Will be more than happy to help you out. Hi Kyle, No question what my niche will be. Already created 2 sites within the broader pet topic. Awesome, just remember you should focus on just ONE website and create success with that before diversifying and creating multiple niche websites. Welcome to WA. You are in the right place and in good hands. I'm pretty sure you can make it big here! That's how easy it is to learn in WA. Just commit yourself, give time and focus and you will surely get your goals here! Please send me a message if you need some assistance. I am willing to help to the best of my knowledge. Hi Ruel, Thanks so much for that warm welcome. I'm definitely going to check out your links. Seems like you've accomplished quite a bit in such a short period of time.